Join the Urban Data Visualization Lab (UDVL) and the University Library on Friday, November 16th, 2018, from 9:45 am – 3:00 pm to celebrate GIS Day 2018 at the Richard J. Daley Library (1-470). This event is free and open to the public, and is made possible through the generous support of the Sööt Family Fund. Light refreshments and lunch will be provided. GIS (Geographic Information Systems) and visualization techniques allow us to organize, analyze, and communicate data. GIS Day is an opportunity to celebrate innovative projects that use these techniques, network with other users, and participate in hands-on applications of the technologies. 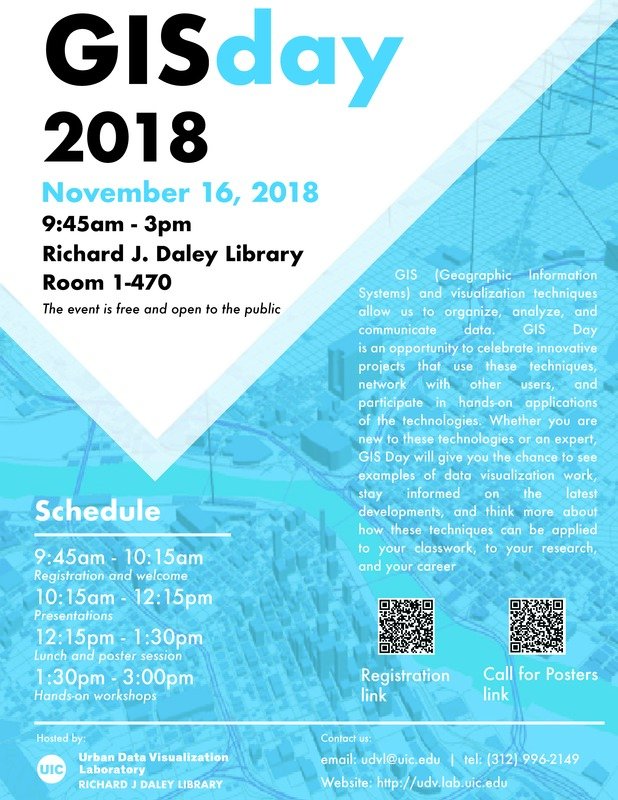 Whether you are new to these technologies or an expert, GIS Day will give you the chance to see examples of data visualization work, stay informed on the latest developments, and think more about how these techniques can be applied to your classwork, to your research, and in your career. We welcome posters about research or applications of spatial analysis and visualization across all disciplines. The call for posters is open to all professionals and academics (students, faculty, and researchers), from UIC and other institutions who use and develop these techniques. If you have any questions, please contact udvl@uic.edu or visit our website: http://udv.lab.uic.edu. Thank you in advance on behalf of UDVL for making GIS Day 2018 a success!